Ⓟ 1971 Atlantic Recording Corporation, Warner-Pioneer Corporation, Tokyo, Japan. Comes in a gatefold sleeve with obi-strip, printed brown inner sleeve (with Stairway To Heaven lyrics on one side and track list on the other) and double faced insert with lyrics. Including obi, brown inner sleeve. Title appears on obi while actually no title appears on label as per other countries release. 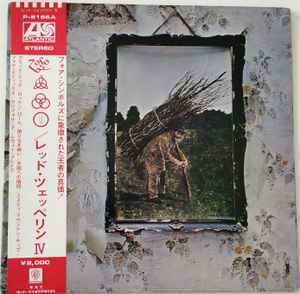 - same obi graphics vs 1976 Led Zeppelin = レッド・ツェッペリン* - Untitled = レッド・ツェッペリン ＩＶ pressing but different catalogue and price (2.500 yen).